A brilliant depiction of an unusual psyche and a world hidden from view,Convenience Store Woman is an ironic and sharp-eyed look at contemporary work culture and the pressures to conform, as well as a charming and completely fresh portrait of an unforgettable heroine. 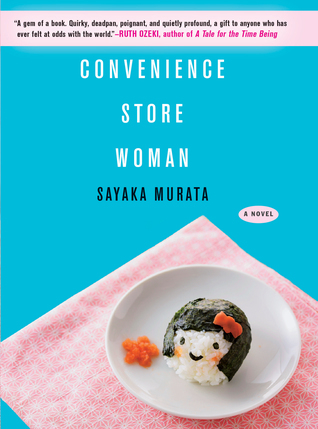 My first book for the JLC12 is Convenience Store Woman by Sayaka Murata. I was provided with an ARC of this one last year, but wasn't too sure I wanted to read it. For some reason it just didn't appeal to me at the time. However, after reading some positive posts about it and learning that the JLC would be continuing this year I figured I would give it a go. So, I picked up my Kindle and dove right in. And let me just say - Hurrah! I'm so happy I read Murata's story - it was fantastic! 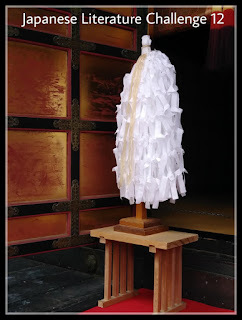 CSW is a quirky tale about a woman named Keiko. She's thirty-six and works at the same convenience store she started working at when she was eighteen. She has no real friends, significant others, and is not particularly close to her family. In fact, the only time Keiko shows any real emotional attachment is when she is talking about or thinking about or working at the convenience store. That place gives her life - I'm serious. As a child, Keiko was the oddball. She was the kid no one wanted around. Why? Well, it could be due to her "strange" behavior. One time, two boys were fighting and everyone was screaming for them to stop. So, what did Keiko do? She ran and grabbed a spade from the tool shed and whacked one of the boys over the head with it. Her explanation was that she helping to stop them from fighting. Or, what about the time she pulled down her teacher's clothes. The teacher was crying and carrying on and everyone was begging her to stop. So, Keiko remembering something she saw on TV, decided to try it on the teacher - she pulled down the teacher's clothes to quiet her. Yep, two incidents of "strange" behavior that had everyone worried about Keiko. Her parents sent her to therapy, they showered her with love, and her little sister followed her around. As for Keiko, she just didn't understand what all the fuss was about. In her mind, she was fine. In everyone else's minds, they couldn't understand why she acted this way - why couldn't she just be "normal?" Eighteen years have passed and Keiko is still working at the same convenience store she got hired at when she was eighteen. Her life consists of a routine she has fine-tuned over the years. She works part-time, visits with "friends" on her days off, and phones her family. Nothing has truly changed for Keiko, except she is getting older. And that means that people are once again starting to wonder about her. They are starting to ask questions - why do you still work at a convenience store; who are you dating; why aren't you married? And, Keiko's stock answers/phrases to these questions no longer seem to apply or suffice. Her "friends" are starting to look at Keiko like she is someone they don't want to talk to anymore. And her family is tired of hearing the same muted responses from their daughter/sister. No one seems happy about/for Keiko. As for Keiko herself, she is good. Her work brings her peace. At the convenience store she has her role to play and she enjoys it - she wears her uniform, repeats the same phrases of greeting to her customers, knows her job inside out, and behaves in the same manner day in and day out. She likes the uniformity of her job, because she is able to wear it well and finally "fit in" somewhere. Its like a mask she puts on and it has molded to her face to the point she no longer knows herself outside of the store - she even dreams in convenience store colors. And then, everything changes the day she meets a guy at work. He's the newbie that has to be trained. Except all he does is complain, criticize, refuse to actually work, and come in late. He winds up getting fired. Oh, and did I mention that he stalked female customers? Yeah, the guy was a total creep. So, when Keiko runs into him outside the store and takes him to a coffee shop, I kind of figured that life was about to change for her. Lets just say it changed in some pretty major ways, but then it didn't. In the end, Keiko was left exactly where she belonged. And that is all I will write about this gem of a story. Murata has created a wonderful character in Keiko. She is a woman who is true to herself in so many ways. She does try at times to "fit in", but in the end, she knows who she is. I found myself warming up to Keiko at times - I could relate to not fitting in (who can't, right?). I just couldn't relate to some of her quirks - like when she thinks about quieting her crying nephew by stabbing him with a small knife. Yeah, sometimes, she was a bit too odd for my tastes. Overall though, I agreed with her when she pondered over the idea of how people accepted her when she fit into their idea of what constituted as normal - having a deadbeat boyfriend is normal, but being alone is not? What the hell? Seems like Keiko was living her life - working, living in her own apartment, and socializing on the weekends. What more could she be doing right? Well according to society, she could be married, having kids, working at a better job, living in a better apartment, having more friends, etc.. Except, Keiko didn't want any of that. She was fine with her life. She was good with it. So, what was society's problem? She wasn't hurting anyone - why did they care so much to question her choices? And that is the point. To conform or not to conform - oh, the problems that question will bring. I love Murata's exploration of conformity in modern day Japan - it was truly a treat to read. Talk about a new favorite. I just loved this book to bits! I can't wait to read more of Murata's work - I read that its finally being translated into English (she has ten books under her belt!). And, I also learned that she still works part-time in a convenience store. Yep, her job as a CSW is what inspired her to write this story - how cool is that?! And now, I'm off to peruse through The Penguin Book of Japanese Short Stories. I noticed one by Yoko Ogawa in there and I have to read it ASAP. She is one of my favorite writers and I am jonesing for her latest book, The Memory Police. I've already pre-ordered it and am counting down the days until I get my copy. I thought this book was delightful as well. I passed it on to my almost 92 year old mother and she loved it as well. Loved it to bits. That is all I need to hear. I have it on my Kindle after it made the rounds last year. This book sounds like one I will enjoy; she is seen as odd but has a rather happy existence. M, thank you :) I loved this character, too. Such an odd duck, but definitely endearing in some ways. I never thought about the importance of convenience stores, but I like how you did especially after seeing them firsthand in Japan. Makes me think about when I lived in England and how surprising it was to me that people often shopped for food every day or every few days - whereas here in the US people tend to do weekly shopping. I'm glad you enjoyed my review. Lark, you need to read this one - you will LOVE it. And, YES to the new Ogawa!! Ti, YES!! You will LOVE it so much. I'm just about to finish this - I'm loving it. I see Keiko as being on the autism spectrum, which helped to explain (to me) her out-of-the-ordinary reactions/responses to the emotional state of others. Thrilled to learn that more of Murata's books are being translated into English.